With moira williams, I am co-curating TALK BACK, a month-long exhibition for artists and organizers with disabilities. 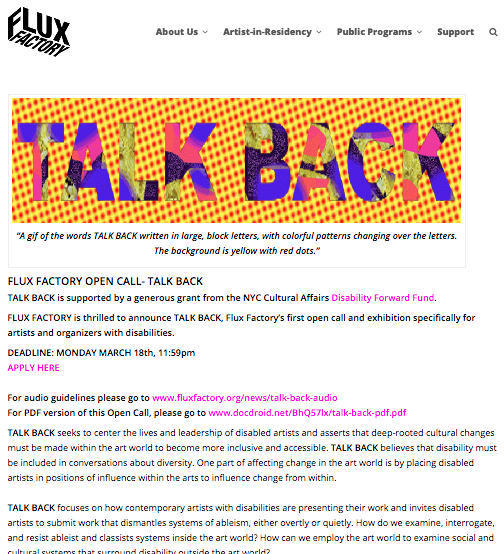 TALK BACK will run from May 9 - June 2 at Flux Factory (Queens, New York), activated with performances, workshops, panel discussions, and other events. Our open call just launched; please spread the word! More information here. 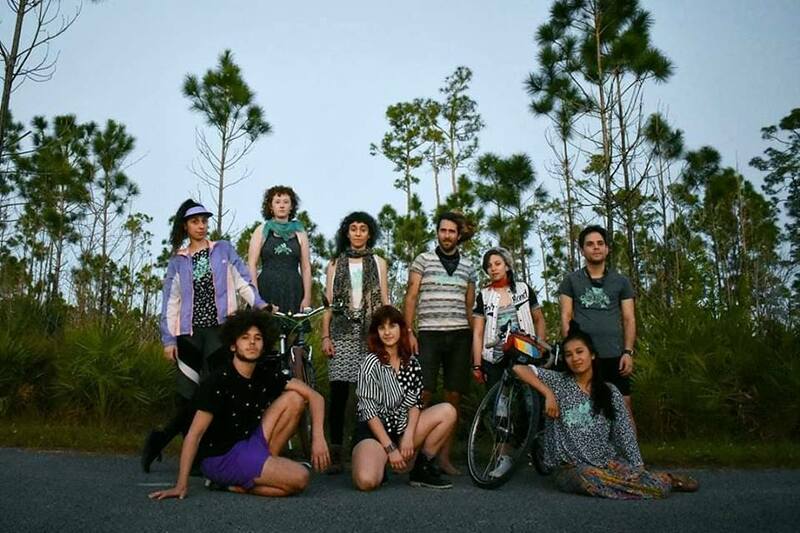 Meet the Agile Rascals - a multi-disciplinary team of creatives, collectively working on an original environmental-themed show that will tour around Florida… on bicycles! This month, we’re the Artist-in-Residence in the Everglades. I’ll be building a set from upcycled plastics, styrofoam, fabric, and other materials. Follow our journey on instagram (@agilerascaltheatre) and, if you’re in Florida, check out one of our free shows! I am in San Francisco! I will be leading collaborative, multi-disciplinary, multi-day workshops as the visiting artist at Phillips Brooks School (K-5) and San Francisco Day School (K-8). I will also be leading a commUNITY quilt project with parents from refugee families with ArtTogether. River Alive! permanent exhibition at the Independence Seaport Museum is now open. This is a 4,000 square foot exhibition, focused on the wonders and challenges of the Delaware River watershed, our place within that system, and the increasingly sophisticated science we use to understand the watershed’s complexity. I created 16 wearable soft sculptures for the interactive theater portion of the show. View images here. Thrilled to be the set designer for Agile Rascal, a bike touring theater group! In January 2019, we will be heading to Florida as the Artist-in-Residence at the Everglades. Find out more and support the project on our Kickstarter. 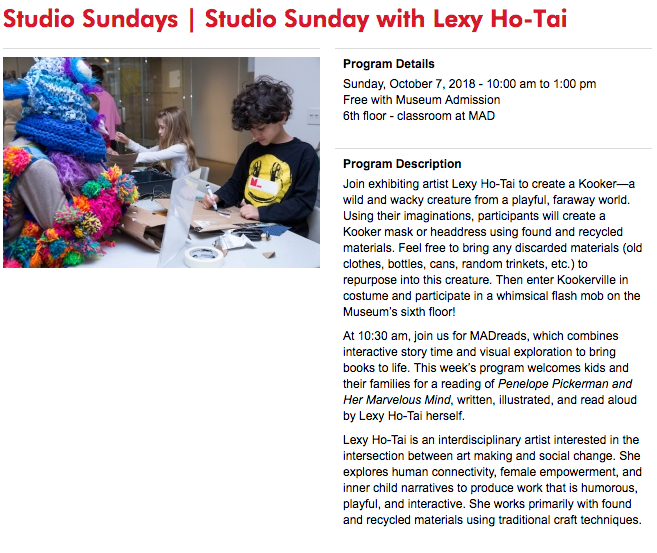 Join me this Sunday at MAD Museum for a “Kreate a Kooker” workshop and a reading of my children’s book, Penelope Pickerman and Her Marvelous Mind. 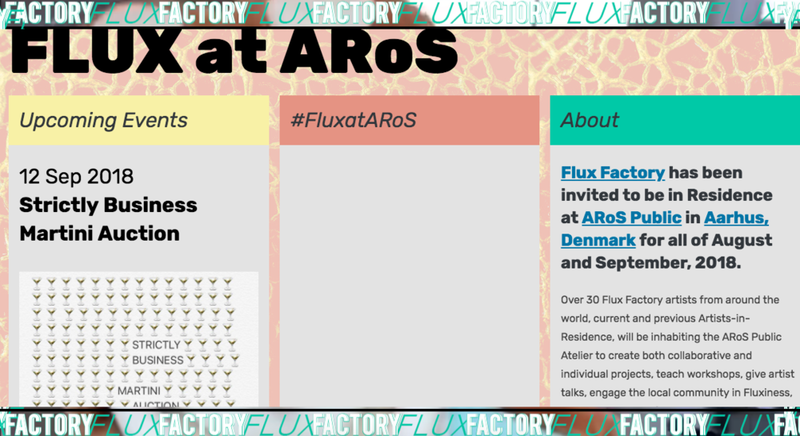 I am thrilled to be in Aarhus, Denmark for the next few weeks, as an Artist-in-Residence at the ARoS Museum with the Flux Factory. Along with 30+ Flux Factory artists from around the world, we will be creating collaborative and individual projects, teaching workshops, giving artist talks, and more! Here’s a short video to get a better sense of what we’re doing. My solo show at the MAD Museum is now open, on view from September 6 - November 4, 2018.